Gotham's billboards give away far more than you might think. Batman Arkham Knight may well be, for many, this year's most anticipated game. Originally meant to be in our hands in late 2014, Rocksteady's apparent last effort in the Arkham franchise was pushed back to this June for extra polish - and to no doubt cram the walls of Gotham with even more secrets. Coming off the success of Arkham City, Knight is with good reason expected to deliver great things. 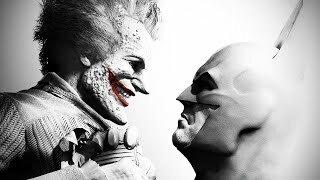 The last Rocksteady-developed game in the franchise was both critically-acclaimed and widely renowned by gamers everywhere and - after a brief drop in quality in Arkham Origins - Knight looks to be delivering on the hype. Details about the game are tantalisingly scarce; we know that the main villains will be Scarecrow and the brand new Arkham Knight (a character created exclusively for the game), we know the Batmobile will be fully integrated into the gameplay, but other details remain hidden. Given Rocksteady's penchant for peppering their titles full of references, easter eggs and other secrets, fans are rabidly combing every bit of information about the game to find tenuous links to Superman, the Justice League and even the identity of the Arkham Knight himself (or perhaps - plot twist - herself?) - here's the best of what's out there so far. Spoilers for every game in the Arkham series will follow.